Trying yoga for the first time can be intimidating. But, a regular yoga practice comes with so many health benefits for senior citizens that you can’t afford to step onto your mat. Keep reading to learn more about the benefits of yoga for seniors, as well as five tips that will help you get the most out of your first yoga class. Physical exercise is essential for seniors who want to stay healthy and independent for as long as possible. When you exercise regularly, you decrease your risk of falls and injuries, as well as your risk of developing heart disease, high blood pressure, diabetes, and certain kinds of cancer. 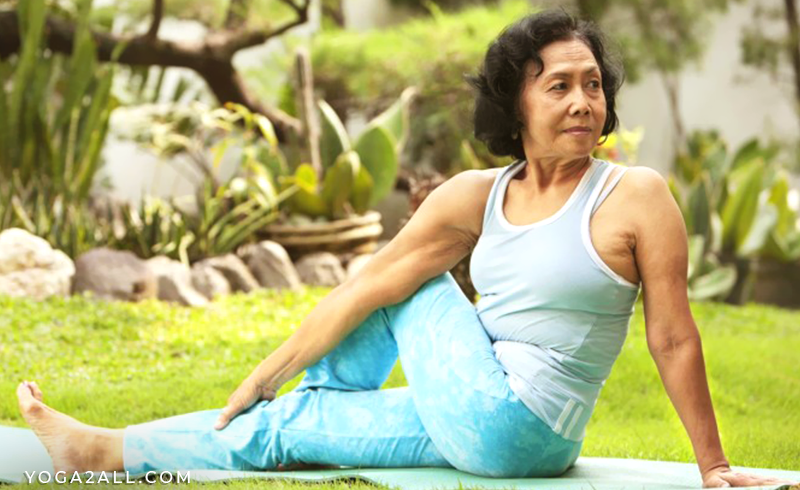 Yoga is a great option for seniors who are just starting to venture out into the exercise world. It allows them to reap all the benefits of regular exercise, without putting excess strain on the joints. Improving your flexibility and range of motion also decreases your risk of falling and injuring yourself. It also makes it easier for you to handle day-to-day activities like grocery shopping and cleaning the house. Some yoga poses also help minimize the effects of the hormonal fluctuations that accompany menopause. They also relieve some of menopause’s most uncomfortable symptoms, including hot flashes and anxiety. When you establish a regular yoga practice, you have some time set aside throughout the week to pause and relax. This helps relieve stress and helps you stay energized and focused as you go about your activities off the mat. In order to reap all the benefits that yoga has to offer, keep these tips in mind. When you’re searching for a yoga class near you, look for classes that are labeled as “gentle yoga” or “yoga for seniors.” This will ensure that your first class isn’t too intensive and will be more restorative. Some yoga classes also incorporate chairs for balance and seated poses. This is a great option for people who aren’t able to stand for long periods of time or sit on a floor mat. If you go into your class dehydrated, you may end up feeling lightheaded as you move from pose to pose. Make sure you drink plenty of water leading up to the class and keep a water bottle close to your mat so you can easily get a drink during the class. Avoid eating too large of a meal before practice. This can make you feel sick or nauseous during the class. On the other hand, some people feel sick if they don’t eat anything at all, especially if they’re taking an early morning class. If you need something in your stomach, you can eat a light snack, like a banana or some oatmeal, about an hour before the class. You don’t need expensive, trendy clothes to practice yoga. Dress comfortably for your first class, and make sure you’re wearing clothes that are easy to move around in. For most people, this means sweatpants or leggings and a fitted top. Yoga is typically done barefoot. However, you can wear non-slip yoga socks if you’re worried about slipping. 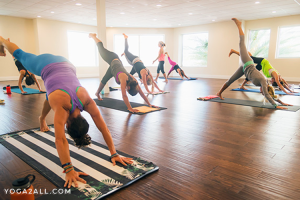 It’s normal to experience some soreness after your first yoga class, especially if you’re new to exercise in general. Don’t let the soreness stop you from coming back! In fact, the more you practice, the less sore you’ll be each time. Finally, be patient and stick with your yoga practice to really see results. Remember, one hour of yoga isn’t going to drastically improve your health! Don’t feel bad if you have a hard time keeping up with your first class, and don’t worry if you have to modify a pose with a block or bolster. Yoga can be intimidating, and it’s easy to feel like you’ll never catch up with the people around you. However, everyone has to start somewhere, and there’s no shame in being a beginner. Stick with regular classes, and you’ll find that it soon gets much easier!